There are three subspecies of Gorillas: the Western Lowland Gorilla, the Eastern Lowland Gorilla, and the Mountain Gorilla. The largest primate, the gorilla has a robust build with a big stomach, long thick arms and short legs, and wide hands and feet with thick digits. Males weight up to 210 kg (462 lbs) and stand as high as 1.80 m. (6 ft) and females up to 114 kg (250 lbs) and 1.5 m. (5 ft). Mountain gorillas have a long and silky coat of a blue-black to brownish gray color. Older males have a distinctive gray saddle, the reason they are commonly referred to as silverbacks. Mountain gorillas live in the border region of Zaire, Rwanda and Uganda in forests between 2,800 and 3,400 meters (9,200-11,200 ft), where the landscape is composed of massive trees of a few species and dense undergrowth. Their diet is composed principally of leaves, shoots and stems. They have regular patterns of activity and spend 30% of their time feeding, 30% traveling , and 40% resting mostly at midday. The activities are synchronized, revolving around the silverback leader. They build nests on the ground or in trees to sleep in at night and sometimes for their midday nap. Their social system consists of a nonterritorial harem. 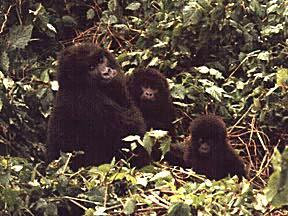 A mountain gorilla group typically contains 1 silverback, 1 young adult blackback son, 3 wives, and 2 young. Their home ranges between 4 and 8 square km, but the ranges overlap from year to year, have no sharp boundaries and are undefended. Males live 50 to 60 years and females 40 to 50. Their reproduction is very slow. The gestation period is 8.5 months with the first birth at 9 to 12 years. The average interval between births is 4 years. Males are infertile until they become silverbacks at 11 to 13 years. Gorillas are not the savage creatures they have been portrayed. They are gentle, even pathetic ceatures that have been driven to the edge of extinction by humans. Outside of the occasional leopard, humans are their greatest predator. The gorillas owe their bad rep to the impressive charging and chest beating the silverbacks display when threatened. 99 % of their charges however are bluff, and silverbacks rarely follow through. If they are pressed though, they will follow through and too many of them have sacrificed their lives at the guns and spears of poachers and zoo collectors. Where persecuted, gorillas flee for miles after a human encounter, their path strewn with liquid dung, a sign of panic. To face up to such fear and die defending one's family is nothing short of heroic.